The Montreal Expos may be long gone, but the team's old logo is enjoying a noticeable revival — and not just with baseball fans. The team's vintage red, white and blue cap, with the tricolour "M" on the front, has become an improbably popular fashion accessory for a younger, urban crowd. The Montreal Expos may be long gone, but the team's old logo is enjoying a noticeable revival — and not just with baseball fans. The team's vintage red, white and blue cap, with the tricolour "M" on the front, has become an improbably popular fashion accessory for a younger, urban crowd. Expos caps are in fact seen far more frequently on the streets of Montreal these days than when the star-crossed franchise actually existed, with its last painful years spent playing to minuscule crowds at Olympic Stadium. This week the sight of those caps brings bittersweet memories for the team's long-suffering fans. It was on Aug. 12, 1994, that the Expos' best season ever was ended by a labour dispute. The franchise is now enjoying its best season since then, only the team is in Washington and it's now called the Nationals. Eight years after the team left town, the colourful headwear is not only a daily sight in Montreal's subway cars and downtown streets. Tourists have also noted spotting it in far-flung locations such as Chicago and Los Angeles. It might not actually be baseball nostalgia leading the trend. As has been the case for other sportswear, the Expos cap has been described over the years as a gang symbol in a number of North American cities — including Los Angeles, Seattle, Wichita and, naturally, Montreal. According to Ken Haqq, sales manager for New Era Canada, the popularity of the logo actually spiked three or four years ago when several hip hop artists, including the members of the popular American duo Outkast, started sporting the old cap. "Our [Expos hats] were going from coast to coast," he said. Expos caps are now the third-biggest sellers in Canada, behind only the Toronto Blue Jays and the New York Yankees, according to New Era, the official ball cap manufacturer of Major League Baseball. In the past year, though, Expos gear has become even more popular in Quebec, while tapering off somewhat in the rest of Canada, Haqq said. In Montreal, the vintage caps have become a key accessory for stylish teenagers likely too young to remember the team. The logo's popularity has been spurred by the province's own hip hop stars, many of whom wear it during performances. "We were selling a lot of Yankees stuff, but now the Expos are a big seller too," said Robert Araujo, whose shop, Logo Sports, is brimming with Expos hats in a multitude of colours. Different versions of the cap have become popular. There's the familiar tricolour one the team wore before 1992, and newer creations in black, red and even teal. The post-1992 blue cap, which the Expos wore for the latter part of their existence, is a less common sight. Araujo, a longtime fan and a bat boy for the team in the early 1980s, said it's hard to know exactly what has prompted the revival. At least for some, "it's a fashion thing, no doubt," he said. But there's also a resurgence amongst some of the old diehard baseball fans. After mourning the franchise's painful final years and its 2004 departure, some fans are more willing these days to look farther back and reminisce about the glory days. This summer, hundreds of fans attended meet-and-greets with members of the old club at a weekend reunion in honour Gary Carter, the Hall of Fame catcher who died of brain cancer in February. And increasingly, there are rumblings about bringing a minor-league team to the city. 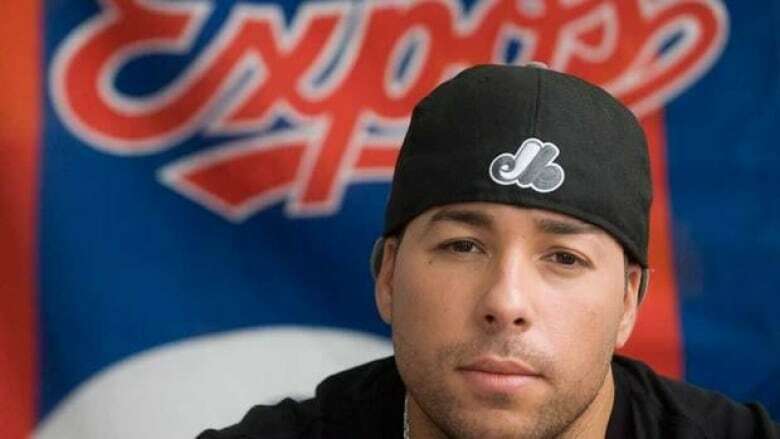 "It's like stages of grief," said Annakin Slayd, a Montreal hip hop artist who made a tribute song about Carter that went viral. "I remember being at the last games and not feeling anything — it was just more shock. And then after that it was anger, and then [sadness]. I think over time the anger turned into reflection, and a little bit of celebration. And that's where we are now." At one point, Slayd said so many Quebec rappers were wearing the cap that he found it upsetting, since it made wearing one seem more a fashion statement than anything else. "We're also a very nostalgic generation," said Slayd, 34. Remembering the good times, though, always gets a little harder for Expos fans around this time of year. Eighteen years ago this week, the Expos had the best record in Major League Baseball — 74 wins and 40 losses — and seemed poised for a trip to the post-season. But any hope of the team's first World Series came crashing down when a work stoppage forced an abrupt end to the season. The team was broken up in a fire sale during the offseason, its best players went on to star elsewhere, and the Expos began their decade-long death spiral. Ever since then, fans have been left wondering whether an extended playoff run that season might have saved the franchise. "I think about it on occasion, but I try not to think about it too much," said Paul Berry, a 31-year-old Montrealer and lifelong Expos fan. The memory has been made a little more bitter this year by the success enjoyed by the relocated franchise, the Washington Nationals. The team is in first place with seven weeks left. It's the best season the franchise has ever had — unless you count 1994. Berry, a high school teacher, has noticed more of his students donning Expos gear to school. He suspects it may be more a question of style than an homage to the old club. His teenage students were just kids when the team left town, and many never got a chance to see them play. "I think the sports logos that kids wear today have a lot to do with fashion," Berry said. "I think it also has a lot to do with city pride." For Berry, though, there's more to putting on the Expos colours. "I have so many memories of going to games — a lot of it is associated with my family, and a lot of them are good ones," said Berry, who has an Expos tricolour hat, a bullpen jacket and t-shirt in his wardrobe. "I do want to keep the team alive and I don't think they should be forgotten about. And there's this kernel of hope in me that one day there will be a Major League team back in the city."